ADI公司的ADSP-21483, ADSP-21486, ADSP-21487, ADSP-21488和ADSP-21489是第四代SHARC®处理器,基于单指令多数据(SIMD)核,支持32位定点和32/40位浮点算法格式,具有400 MHz/2400 MFLOP,提高了性能,基于硬件的滤波器加速器,音频性能和集中于应用的确外设,支持最新环绕声译码器算法的新存储器配置.主要用于工业控制,汽车音频和医疗电子.本文介绍了ADSP-2148x系列产品主要特性,方框图,以及评估板ADSP-21489 EZ-KIT Lite®主要特性,框图,电路图和材料清单. 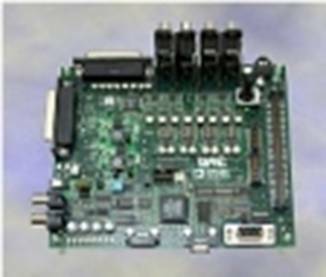 The SHARC ADSP-21489 is one of two new members of the fourth generation of SHARC® Processors, that now includes the ADSP-21483, ADSP-21486, ADSP-21487, ADSP-21488, ADSP-21489 and offers increased performance, hardware-based filter accelerators, audio and application-focused peripherals, and new memory configurations capable of supporting the latest surround-sound decoder algorithms. All devices are pin-compatible with each other and completely code-compatible with all prior SHARC Processors. These newest members of the fourth generation SHARC Processor family are based on a single-instruction, multiple-data (SIMD) core, which supports both 32-bit fixed-point and 32-/40-bit floating-point arithmetic formats making them particularly suitable for high-performance audio applications. The ADSP-21489 offers the highest performance �C 400 MHz/2400 MFLOPs �C in an LQFP package within the fourth generation SHARC Processor family. This level of performance makes the ADSP-21489 particularly well suited to address the automotive audio and industrial control segments. In addition to its high core performance, the ADSP-21489 includes additional processing blocks such as FIR, IIR, and FFT accelerators to increase the total performance of the system. There is a new feature called Variable Instruction Set Architecture (VISA) that allows the code size to be decreased by 20% to 30% and increase the memory size availability. The fourth generation DSP allows the ability to connect to external memory by providing a glueless interface to 16-bit wide SDR SDRAMs. Fourth-generation SHARC Processors also integrate application-specific peripherals designed to simplify hardware design, minimize design risks, and ultimately reduce time to market. Grouped together, and broadly named the Digital Applications Interface (DAI), these functional blocks may be connected to each other or to external pins via the software-programmable Signal Routing Unit (SRU). The SRU is an innovative architectural feature that enables complete and flexible routing amongst DAI blocks. Peripherals connected through the SRU include but are not limited to serial ports, IDP, S/PDIF Tx/Rx, and an 8-Channel asynchronous sample rate converter block. The fourth generation SHARC allows data from the serial ports to be directly transferred to external memory by the DMA controller. Other peripherals such as SPI,UART and Two-Wire Interface are routed through a Digital Peripheral Interface (DPI). The ADSP-21489 EZ-KIT Lite® provides developers with a cost-effective method for initial evaluation of the ADSP-21483/21486/21487/21489 SHARCs® Processors via a USB-based, PC-hosted tool set. With this EZ-KIT Lite, users can learn more about the Analog Devices (ADI) ADSP-21489 hardware and software development, and quickly prototype a wide range of applications. The EZ-KIT Lite includes an ADSP-21489 SHARC Processor desktop evaluation board along with an evaluation suite of the VisualDSP++® development and debugging environment, including the C/C++ compiler, assembler, and linker. The evaluation suite of VisualDSP++ is designed to be used with the EZ-KIT Lite only.